This one was a vengeance win. One that was a missing garnish in Taj’s decorated career. After being emotionally robbed in 2008 by Slater (As you’ll see below), making the Final in 2013 definitely birthed some flashbacks. Most everyone was in Taj’s corner, partially because of him being a veteran and having never won at Lowers, and partially because of that dreaded loss back in ’08. After a heated battle with Jules, who was surfing out of his head the entire event, Taj ended up walking away victorious. This would turn out to be Taj’s last-ever career win on tour and rid his closet of that ugly skeleton. The waves may not have been pumping, but got-damn, was this an all-out slugfest. Score after score, exchange after exchange, the two left nothing in the tank by the time buzzer sounded. This was fresh off Mick’s incident at J-Bay last year and after taking a 13th in Tahiti, this win pumped new life into his 2015 campaign after a strange couple months. 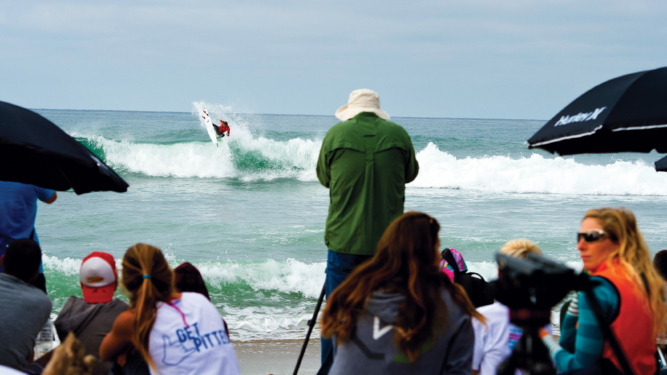 Although ADS would go on to win the title, this Final display the fact that competitive ferocity was alive and well in the sport of pro surfing.